In the late 1800’s and early 1900’s, steam tractors were the primary method of agricultural development. But out in California, they had a problem: the incredibly heavy tractors kept sinking into the soft earth. One solution sometimes used was to lay wooden planks ahead of the tractors, but this drastically decreased speed and was expensive to do. In 1904, Benjamin Holt came up with the brilliant idea to attach the planks to the tractor, creating a track that replaced the wheels. The unique way Holt’s tractor moved was compared to a caterpillar, giving the new tractor design its name. In 1925, Holt Manufacturing Company merged with C. L. Best Tractor to formed a new company with a name that reflected the product that had become so famous. Both Holt Manufacturing Company and C. L. Best Tractor had great success during WWI, but floundered after peace was reached. The two competitors’ merge came about because of both their financial struggles. To come back financially, Caterpillar had to do a couple of things. First, they began making diesel engines in 1931. They also began to focus on developing construction equipment. This change did very well for them, as the company thrived during the post-WWII construction boom. Having successfully conquered the construction market, Caterpillar began branching out in the late part of the 1900’s. They began building truck engines for both on- and off-highway applications, and entered the global market. In 2008, they exited the on-highway diesel engine market, since 2010 EPA standards would lead to expensive changes and the market only lead to a small percentage of their sales. Caterpillar first started manufacturing the C15 in 1999, and didn’t stop making it until 2007. Keep in mind that this article is about the single-turbo C15s, and not the ACERTs (though look out for that one in the future!). The C15s, especially the early ones, are known to be good and reliable engines. They are the engine we sell parts for the most, since they are so popular. The early C15’s with a 6NZ serial number prefix only have one turbocharger and simple electronics, and weigh less than the 3406E, which was the C15’s predecessor. Many parts are interchangeable between the 3406E, C15, and C15 ACERT, but there are slight differences that are very important to note. Caterpillar made the C15 to improve on the 3406E. The C15s see less oil leakage than the older design. They also have relief slots in the bottom of the cylinder head to keep the head gaskets from getting crushed. Don’t let the naming of the C15 ACERT fool you. Many people think that the ACERT is different only because of the second turbocharger, but that is far from true. The ACERTs actually have the same stroke as the C16’s. They also have a completely different piston design. The ACERTs have the one-piece steel pistons, as opposed to the C15’s two-piece, aluminum skirt piston design. There’s also the whole emission technology thing that gives the ACERT its name, too. C15 engines are on-highway engines. They can be found in Peterbilt and Kenworth trucks. Now, remember those relief slots mentioned above? While a great idea, it has been noticed by multiple shop techs that head gaskets tend to fail a little more often since those slots were introduced. That being said, if you keep an eye on it and buy quality gaskets it shouldn’t be much of an issue. Another big problem Caterpillar had with the C15s was the Bridge engines. Bridge engines are C15s made in 2002 and 2003 with an MBN serial number prefix. They were meant to bridge the gap between the pre-emissions 6NZ and the emissionized ACERT engines. They are widely known to perform poorly, even earning them the joking expansion of “Much Bad News” for MBN. The stock engines do not pull well, the exhaust temperatures run high, and they have terrible fuel consumption. Many people with the engines have either replaced them or updated the ECM to codes for a different engine. After the C15 was on the market long enough, aftermarket companies got their hands on it and do what they usually do: make improvements! 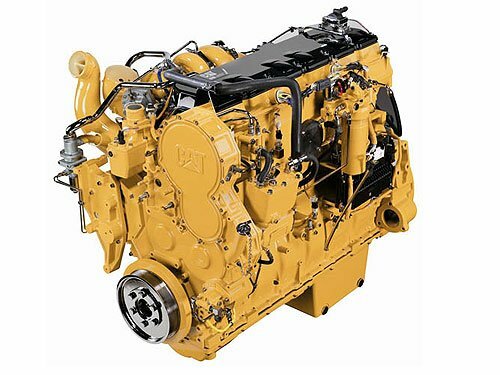 Since Caterpillar debuted the C15, the aftermarket manufacturers have spent a lot of time improving the original designs that Caterpillar engineered. The piston skirts have a graphite coating to help keep them from seizing in the cylinder. The rod and main bearings are constructed from a tri-metal blend to increase durability. The cylinder liners are also induction hardened, which reduces bore wear. Though not an improvement in engineering, all of HHP’s aftermarket inframe or out-of-frame rebuild kits will have brand new pistons. When you buy kits from Caterpillar, the pistons in the kit are used - that’s why they make you pay a core charge. Or view the PDF here. We have a very large offering of parts for C15s of all ESN prefixes. The ones below are some of our most popular. This cylinder head is not only one of our best-selling C15 products, it is our best-selling product, period. It is made to fit on all 3406E, C15, and C15 ACERT engines. It’s a completely new, forged casting that has a higher nickel content that leads to increased strength and durability. The valves, springs, retainers, keepers, and cam bearings are all already in the head, saving you the expensive time of installing all these components yourself. Plus, it’s specially designed with widened passages and a thicker deck to allow for a higher coolant flow. But the best part? It costs way less than what Caterpillar would charge you for a cylinder head that doesn’t have the benefits this one has. As mentioned above, the 6NZs are the most popular of the C15s and this particular inframe kit is one of two we offer for 6NZ engines. The kit includes induction-hardened cylinder liners whose design helps reduce bore wear bi-metal piston rings that are made to resist wear, and o-rings with an updated design that totally prevents coolant from leaking into places it should never go. Don’t worry, it has all the other components of a typical rebuild kit too, these are just some of the coolest. To see everything the kit contains, check out the page. Keep in mind that any time you go to purchase a rebuild kit (whether it’s inframe, out-of-frame, or re-ring) from HHP, we are going to require an engine serial number. No kits fit universally to an engine model, and we need to use our super-secret files to check which kit your engine needs. Trust us, you don’t want the wrong kit - and we won’t sell the wrong one to you. Everybody loves a good turbo, and here at HHP, we won’t sell you a bad one. This particular turbo is made by manufacturers that supply the OE, so you know they’ve got the manufacturing process down. All components are thoroughly inspected for fit and finish before the turbo is even put together. Each turbo is perfectly balanced to ensure long-lasting and dependable power. Don’t mind a remanufactured turbo and want to save a few extra bucks? We’ve got that too. Have you heard us talk about Delphi fuel injectors yet? Well, if you haven’t, here’s the quick and dirty. Delphi makes pretty amazing fuel injectors, especially for C15 engines. This particular injector is guaranteed to have a new nozzle for proper fuel flow and atomization. It also has a completely new actuator assembly, including spill valve, NOP spring, washer, shim, and stop. And all the o-rings are brand new too. That’s a lot of “new” in a remanufactured injector. Highway and Heavy Parts is fully committed to the success of our customers. If you have any outstanding questions about the C15, or parts for your Caterpillar engine, please give us a call at (844) 215-3406.